Sidelined for almost three years with a horrific knee injury, Shaun Barker never doubted he would play football again. His wife just wondered whether he would be able to walk. 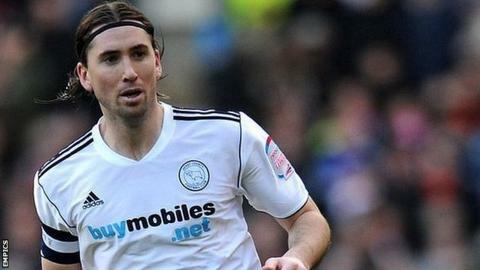 The Derby County club captain needed three operations after dislocating his knee and rupturing ligaments in March 2012. On Wednesday Barker made an emotional return, playing 45 minutes for the the club's under-21s. Rebecca Barker told BBC Radio Derby: "It was a big step. "When I first saw his leg, I thought 'How will he ever walk again, never mind play football?'" The 32-year-old former Rotherham and Blackpool centre-half joined the Rams in 2009 and quickly became a key figure. He was named vice-captain for the 2010-11 season, but a persistent knee injury required surgery towards the end of the campaign and Barker was ruled out for six months. Within six months of his much-anticipated return, he was back in a watching brief again following the awful injury against Nottingham Forest. The helplessness has fuelled his motivation to return - something he insisted would happen even when many said the injury was too severe. "I don't know how he gets out of bed every day to try and do a job that he hasn't been physically able to do for two-and-a-half years," Rebecca said. Nottingham-born Barker has been a confident leader throughout his career, but as he prepared to get back into the action, anxiety began to show. "He wore his boots that he got injured in," Rebecca added. "He was very nervous." However, when Shaun stepped onto the pitch with the captain's armband again, Rebecca shared her pride on Twitter: "Today the man I love is taking a monumental step in his recovery. I can't put into words how I feel. "It's been a long bumpy road but fingers crossed we've arrived." The journey has provided opportunities away from the pitch. Barker set up a blog, took on some media work and set up his own charitable foundation to help underprivileged youngsters in Derby. Although he has kept busy and enjoyed many aspects of his "other" work, Barker has always yearned to get back playing. But it has been such a long time coming that on his recent return to first-team training, winger Jamie Ward introduced Barker to the team as a new player. Barker took the joke in good spirit, describing his subsequent competitive comeback as the "proudest, greatest and most emotional moment" of his career. Friends, team-mates and fans replied in their numbers with messages of congratulations - a response that his wife is thankful for. "It's wonderful. He has tweets from Derby fans, Forest fans and fans from around the country - people who are just pleased to see someone achieve something that they've set their mind to," Rebecca continued. "It's nice to know that after three years of trying his hardest and grinding on, people are still interested, wishing him the best and wanting him to do well."